Eight electrifying page-turners will keep you spellbound and in love with characters you won't want to leave. Read about a young girl’s retaliation, intrigues and crimes in a high rise, secret loves, lies & passion, revenge, dead bodies and virgin pool boys. These gripping stories will offer heart-pounding entertainment until the very end. 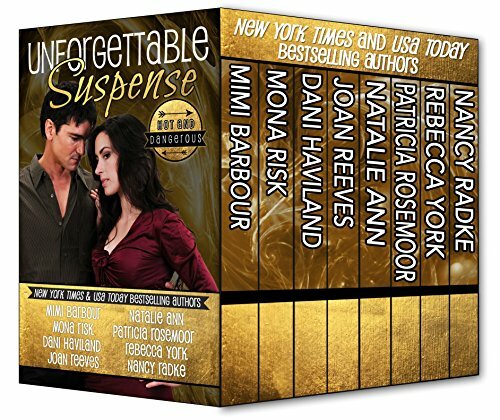 If you like unforgettable suspense then you’ll LOVE this collection. SWEET RETALIATION, Mimi Barbour, New York Times and USA Today bestselling author: A gripping story about one woman's quest for justice! NEIGHBORS AND MORE, Mona Risk, New York Times and USA Today bestselling author: When a neighbor dies in a Florida High Rise, it's suddenly too close for comfort in the building. POOL BOY WANTED: No Experience Preferred, Dani Haviland, USA Today bestselling author: He'd never known a woman before, and that's just how she liked it. HEAT LIGHTNING, Joan Reeves, New York Times and USA Today bestselling: Amnesia stole her memory--her life! What Tessa doesn’t remember may be the death of her. SECRET LOVE, Natalie Ann, Award-winning author: Danger is just as blind as love. SHEER PLEASURE, Patricia Rosemoor, New York Times and USA Today bestselling author: Annie never dreamed her fantasies would lead to danger. Rx MISSING, Rebecca York, New York Times and USA Today bestselling author: Are Marc and a group of strangers trapped in a mind-control experiment? SPIRIT OF A CHAMPION, Nancy Radke, USA Today bestselling author: A champion who won’t quit. Even when men are sent to kill her.